Dr. Daonh A. Nguyen became involved in his profession after graduating with a Bachelor’s Degree in Electrical Engineering from UCLA. He switched to medicine once he answered what he felt was a personal calling to go into medicine and healthcare. He currently specializes in pain relief for terminally ill patients, terminal care, and the treatment of all patients who are experiencing pain. 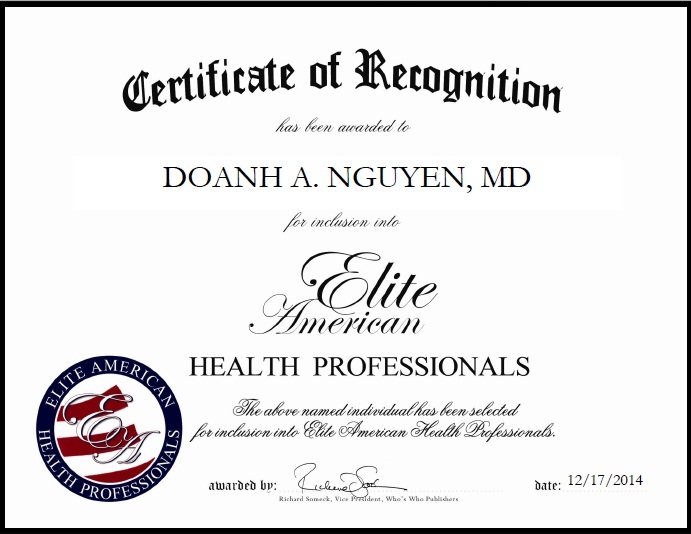 Dr. Nguyen is a recipient of the Patients’ Choice 5th Anniversary Award as granted by Vitals in 2012, and he received Vitals’ Patients’ Choice Award for four consecutive years (2008-2012). He is a member of the American Board of anesthesiology, the American Board of Anesthesiology and Pain Medicine, the American Board of Pain Medicine, the California Society of Anesthesiologists, and the American Academy of Pain Management. This entry was posted in Doctor and tagged anesthesiologist, patient care. Bookmark the permalink.